What burdens do we carry from our family, cultural history and lived experiences? 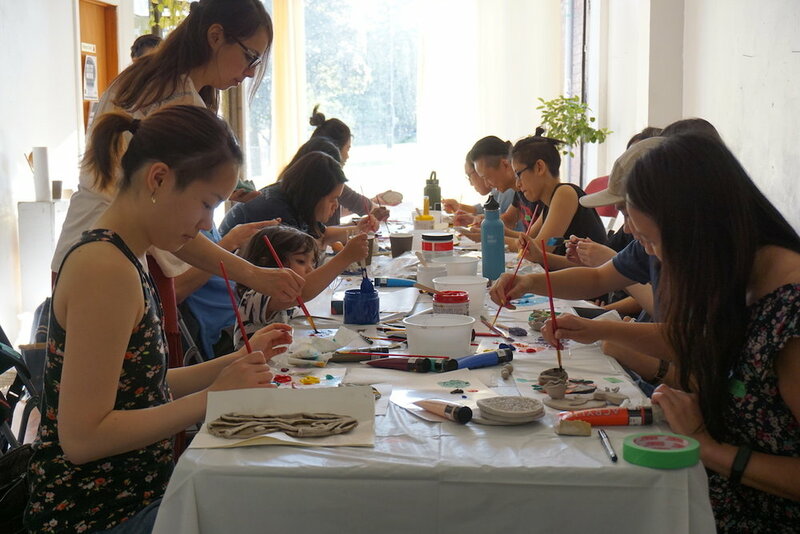 Drawing from our own personal experiences and challenges, Abby and I created a workshop series exploring burdens we carry individually and collectively as Asian disaporic individuals, and translating them through an art-making process. Burdens are specific to every individual, often resulting from factors larger than themselves. Instead of viewing burdens as a heavy emotional weight, burden(some) aimed to envision ways to embrace our burdens and support the sustainability of our community. Highlighting how we can extend care beyond ourselves to others, participants engaged in communal storytelling, and visually manifesting our stories and experiences as a collective floor tile mural. Using art as a means for listening and recording, participants created clay floor tiles. Each tile holds a unique story. The final collective mural reflects the beauty of single parts becoming a whole - shared experiences and shared support. Through this emotional churning, we hope the burden is no longer a burden but a site of possibility.